It's March. It's no longer bitter cold and farmers have started their seeds for their summer crops. But it's still a long ways away from the first farmers' market. I was smart and was a part of a wonderful winter CSA through Shared Harvest in Arlington, MA. In my distributions in November and December I got a dizzying array of winter storage vegetables, garlic, beans, popcorn, last of the season greens, and cheeses. 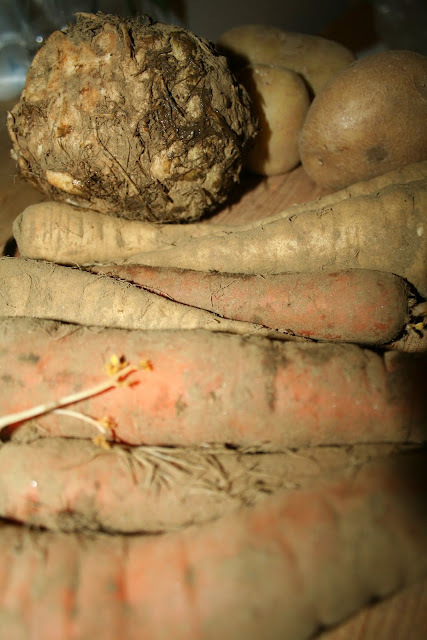 I've slowly been picking off the storage veggies from my fridge and make-shift root cellar for the last few months. But now, I'm really getting to my wits end with tubers, roots, and winter squash. How do you cook this assortment of winter vegetables? Roast 'em. And roast 'em. And, well, you guessed it. Honestly, cut up and toss a carrot, parsnip, butternut squash in the oven with a little olive oil and salt and the flavors all start to taste the same. Getting through winter vegetables is, what we like to say in consulting, "an exciting challenge". I've found that to get through the flavor rut, it's critical to take the traditional flavors in a new direction. What better to offset the sweet, earthy flavor of root vegetables than a rich, tangy, slightly spicy sauce. Enter my French twist on carrots and parsnips. 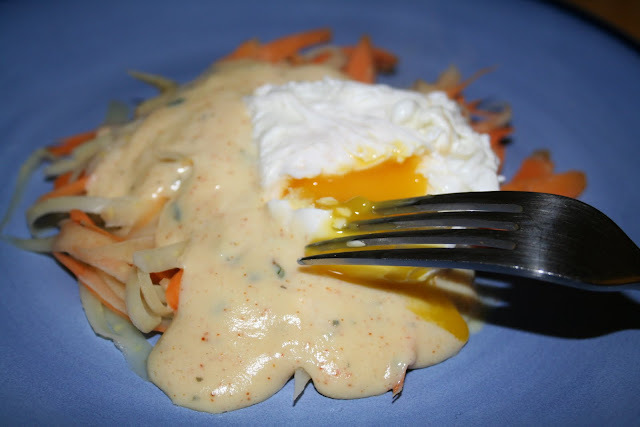 For a small, but decadent meal, I created a ragout of carrot and parsnip "pasta" smothered in a spicy hollandaise and topped with a poached egg. To create the carrot and parsnip pasta, simply use a vegetable peeler to create ribbons of both vegetables. If you'd like them a bit thinner, cut a bunch of quarter inch deep lines along the length of the carrot or parsnip and then use the peeler. Don't worry about making it perfect, just have fun with it. Bring a small pot of water to boil and blanche the pasta for about a minute or two. Meanwhile melt the butter in a shallow sauce pan. In a blender, squeeze the lemon and add the tarragon. Separate two eggs. Now here's where things get fun, because when dealing with eggs, it's really all about the timing. No one wants a cold or overcooked egg. My method requires a tab bit of multi-tasking, but using the blender for the sauce makes the whole process pretty simple. Remove the pasta from the pot to drain and add the vinegar to the water. Reduce the heat slightly so that it's just simmering. Pour the melted butter into the blender with a dash or two of salt. Add the two egg yolks and blend on low for about 30 seconds. Return to your pot of water and crack in a whole egg. Quickly use a wooden spoon to coax the egg white to gently hug the yolk. Add the second egg and do the same. Add the egg whites to the blender and blend on low for another 30 seconds. Pour the contents back into the sauce pan in which you melted the butter. Place this over the pot with the poaching eggs to create a little double-boiler action. Quickly whisk the sauce and add the pepper. You just want to slightly thicken the sauce, so when the whisk starts to reveal the bottom of the pan, you're done. Take the pan off the heat and continue to whisk for another 30 seconds. The eggs only need about 4 minutes to poach in order to maintain the yummy yolkiness. So quickly turn off the burner, plate the pasta, pour sauce over the top, and then top each with a poached egg.